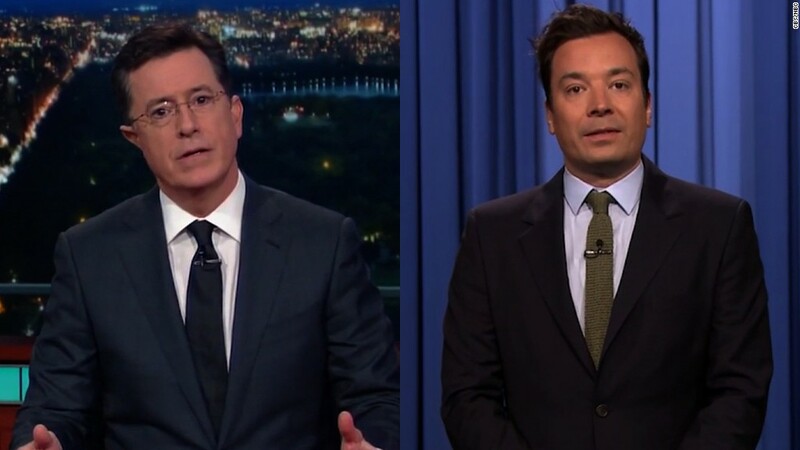 Stephen Colbert, Jimmy Fallon and other late night comics skipped the jokes Monday night to instead deliver somber remarks about the mass shooting that took place in Orlando on Sunday. Colbert opened CBS' "The Late Show" without titles or a monologue instead choosing to speak directly into the camera. "Naturally, we each ask ourselves what could we possibly say in the face of this horror, but then sadly you realize you know what to say because it's been said too many times before," Colbert said. "It is if there is a national script that we have learned." Colbert added that "love gives us hope that change is possible. Love allows us to change the script." Fallon also opened NBC's "The Tonight Show" with brief words about the massacre that took the lives of 49 people on Sunday. "This country was built on the idea that we do not all agree on everything," Fallon said. "We need to support each other's differences and worry less about our own opinions." Fallon continued by saying that the country needs to get back to debate and away from "believing or supporting the idea that if someone doesn't live the way you want them to live you just buy a gun and kill them." "We need to get back to being brave enough to accept that we have different opinions," Fallon continued. "That's okay because that's what America is built on." Colbert's and Fallon's remarks came one day after a mass shooting took place at a gay Orlando nightclub. It is the worst mass shooting in U.S. history. Samantha Bee also spoke about the shooting for nearly eight minutes on her show, "Full Frontal." Bee spoke to the audience of the TBS show, which like CNN is owned by Tuner, with passion and anger over what had transpired on Sunday. "Love does not win unless we start loving each other enough to fix our f***ing problems!," Bee said. NBC's "Late Night with Seth Meyers" used the time usually slated for the Meyers' opening monologue to break down the news around the shooting and the issues surrounding gun control with his segment "A Closer Look." The host of "The Daily Show," Trevor Noah, said that he had to talk about the latest mass shooting "not as a host of show, but as a human being." "It shouldn't be normal. We shouldn't allow this to be normal," Noah said. On "The Late Show," Colbert continued the dialogue with his first guest -- Fox News host Bill O'Reilly. O'Reilly and Colbert debated gun control and what the proper response should be to the shooting. The interview took up a large portion of Colbert's broadcast. Colbert and Fallon also paid tribute to the victims with "The Late Show" setting its lights to rainbow colors while Fallon's band, The Roots, displayed an image of a rainbow heart on its drum set.